I have a lot to share with you tonight, so let me start by saying that I have been marinating this post in my head and in my heart for the past week or so now, and I finally feel ready to sit down and write it. I'm here in my tiny little room in the West Village, cramped between fashion magazines, and yesterday's laundry, hovering over my computer in silence. I'm quiet because something big just happened today - frankly I should have expected it because the skies are calling for a very tumultuous April 2014. Regardless, I didn't see it coming. Today my team at work was called in for a huddle and our Creative Director announced her departure from our company, my company, and I was absolutely, positively, SHOCKED. Just when you think you know how everything is going to play out in life, a hurricane hits, and washes your sandcastle away. Obviously I haven't known about this for even 24hrs yet so you're probably wondering how I've been conceiving of this post for a week then. Well I guess it came full circle when I asked her how she felt about leaving not only our company but New York as well. "Living here is like being in a constant swirl, inside the eye of a tornado, and now...I just want to be on the outside looking in" she said, along with classic, adorable hand gestures that only she can make. And suddenly it hit me, how much more of the madness can I take?! Clearly she is at peace to let it go, she's done her time here and she's ready to say goodbye. So after nearly 5 years here, what exactly am I still holding onto? What more do I feel like I need to prove in this city? For those of you who don't live in New York, the only way I can describe it is like being in the most toxic love hate relationship you've ever had. It's the boyfriend (or girlfriend) you just die to be around, do anything you can to accommodate, just to have 5 minutes of their time (even if it means squeezing into claustrophobic subway cars or apartments), who only ever gives you just enough to keep you interested, but never enough to keep you truly fulfilled, is completely inconsistent (hello transit system!! ), totally high maintenance, and expensive to date, and is always unfailingly wavering between the extremes (oppressively hot or cold, never in between). It's the relationship that should have ended years ago, but the chemistry is too much of a high to let it go. I should note that this really isn't everyone's experience here and I should not assume or generalize that it is. But my time here has been a battle, a boxing match that just won't end. Having to get a new visa for every year I've been here certainly doesn't help matters...actually that has been the primary problem...that and health care. So yes, my boss announcing her departure today inevitably lead me to this post titled Living Authentically because I loved how clearly she was doing just that, following her truth, and how much it called into question whether I was still following mine. When I was away in South America a week and a half ago it really, really, REALLY dawned on me just how hard life in New York is. It's only magnified by this winter that just won't end. I can remember sitting on the beach of Ipanema around 10 am and painting from my travel watercolor kit and makeshift coconut-as-water-cup and feeling completely at peace. Obviously life is not a vacation, and moments like this aren't all that common even at the best of times. But more than that, there were no angry pedestrians climbing over one another to reach the subway, couples breaking into full-on arguments in the streets, random strangers bursting into hyperventilating tears over roommate or career drama. Instead there were passionate sidewalk kisses, and half naked bodies strolling from the beach. Life was much slower and nobody seemed to mind what the hell was happening in the supposed "centre of the universe". I hate sounding so anti-New York...and maybe it's not even about the city, but the people, the collective mindset that this place is all that matters. If you can make it here, you can make it anywhere they say. That might very well be true. This city does attract and keep some of the most incredible talent the world over. I guess my real issue is then with the lack of authenticity. Here people feel like they have something to prove. Nobody willingly moves to New York without the feeling of needing to prove something. And maybe that for them IS living authentically. But I guess I'm just tired of the noise, the chaos, of one-up conversations about who you work for, who you know...are there not more meaningful things in life?! What happened to just being real?! You know the proverb "dance like nobody is watching, love as though you have never been hurt before, sing as though no one can hear you, and live as though heaven is on earth"? Well the thing is, when you're living inside the fish bowl, the centre of the world, and all eyes are on you constantly, it is really, really hard to do those things period lol. Because truthfully people ARE watching. We are living in a time of psuedo-stalking, voyeurism, thanks to facebook and blogging and instagraming and tweeting. It just becomes harder to remember to live for yourself. I guess what I'm hoping to accomplish in writing this then is to show you that I'm only human. I have fears and frustrations and I'm not afraid to show them. Because this for me IS what it means to live authentically and I don't ever want to live any other way. I needed to write this to remind myself that I, nor do you, have anything to prove. All you have to do is follow your truth. Live with integrity and the rest will just fall into place. I'm leaving you with this video from Ipanema Beach because it stands as a reminder to me of my truth. I'm sending so much positivity and love your way and want to thank you all for reading and supporting me from wherever you are in the world. 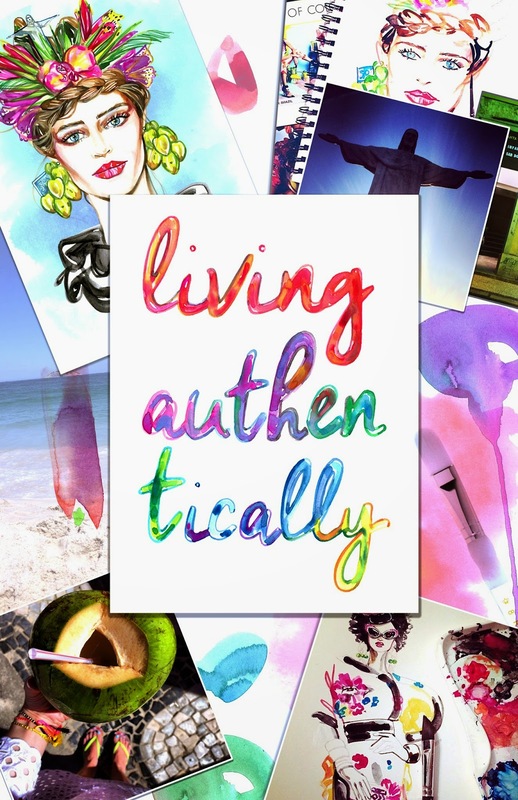 I hope that you will join me in living authentically too. This is an excellent post, thank you for writing it! I am positive that this situation has been divinely placed to help you learn and grow and you'll come through it stronger than ever. I am working on my authenticity / self worth at the moment and have been working with the affirmation "I am enough" which is really helping me. Sending you lots of luck and love. I'm just catching up on your blog and this rings so true. Sometimes I feel like we're all just running around instagramming things to help reinforce the branded version of ourselves, not our actual lives. And I believe NYC (and also the fashion industry) often perpetuates this because everything here feels like a competition... even down to where you decide to eat. Sometimes it is just too much. It's difficult for me to not compare myself to other people when it's that easy to visit blogs, read tweets and follow instagram feeds of people doing things bigger, better, and faster. I've been away from my blog mostly because things in life have been crazy (got married, new job, just moved- ahh! =) but also because I just don't feel like I could ever measure up to those doing something similar to what I do. Like you, I often feel like I think clearer when I'm outside of Manhattan. For some reason everything doesn't feel like such a big deal when I'm outside of it looking in. And as much as I have a hard time imagining living anywhere else, I think it would make more sense and be emotionally healthier to just leave. But then when I'm back in the city I have a New York moment... the kind of moment that only happens because so many different kinds of people doing so many different things manage to survive on such a tiny island and I am reminded the real reason why it is so cool to live here. (Instead of the deceivingly desirable fancy restaurants, bars, high end shopping, proximity to billion dollar apartments, etc). Sorry... that was a long one! !